"If we want to protect them, we have to do it right now." Abramorama has debuted an official trailer for the documentary film Love & Bananas, made by actress Ashley Bell - who directs and stars in the film. The full Star Wars title for this is Love & Bananas: An Elephant Story, and it is indeed a story about rescuers finding and rescuing a 70-year-old blind elephant. After waiting for 2 and 1/2 years for the chance, actor / director Ashley Bell and a team of elephant rescuers led by world renowned Asian elephant conservationist and TIME Magazine's Hero of Asia, Lek Chailert, embark on a daring mission 480 miles across Thailand to rescue Noi Na, a 70-year old partially blind trekking elephant and bring her to freedom. That's what this is about and it looks totally wonderful, and life-affirming, because elephants are the coolest. And sadly they need to be saved as fast as possible. This looks like it's going to be frightening and enlightening all at once. For more info on Love & Bananas or to Join the Heard, visit the official site or Twitter @LoveAndBananas. "You don't need a bull hook to control an elephant. You can guide an elephant with love… And bananas." 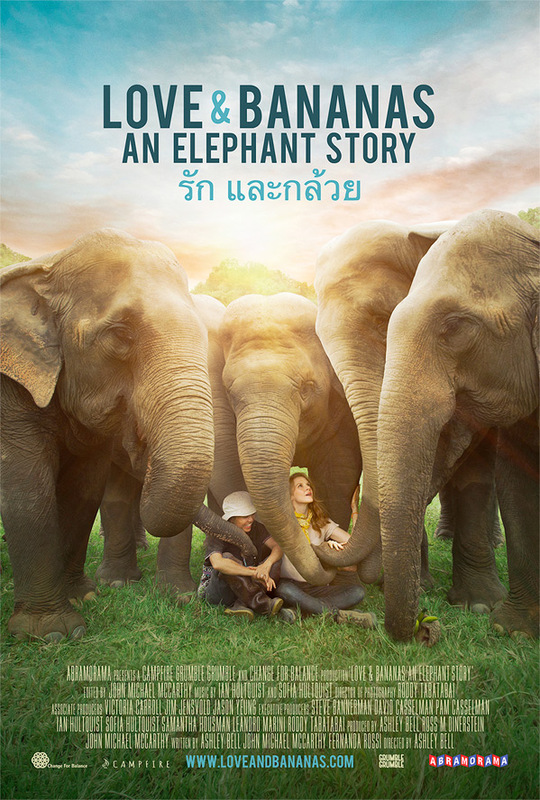 Ashley Bell and a team of elephant rescuers led by world renowned Asian elephant conservationist Lek Chailert, embark on a daring 48-hour mission across Thailand to rescue a 70-year old captive blind Asian elephant and bring her to freedom. Love & Bananas is directed by filmmaker Ashley Bell, an American actress turned filmmaker making her feature debut with this film. This hasn't played at any film festivals or elsewhere yet. Abramorama will release Bell's Love & Bananas in select US theaters starting April 20th this spring. For more info & theater listings, visit the official website. Who wants to see this adorable film?